With both setters still away, Claire, Gabes Sophie also away we went into a game against SNV with Verena and Yulia called up for support. Verena set really well for the group in her first game with us, and some good play on the top of that got us the first and second set. A few too many errors early in the third set put us behind. In went Yulia at opposite and we started to come back, but not enough and we went down 25:23. Nat & Niky owned the net for the fourth set and with many good blocks and some good defense turned into attack we won the fourth 25:16. Solid performance from our ladies here, setting ourselves up mid table with our double header still to come. Our newly trained setter Khyle is starting to work out his role and playing position on court and producing some great sets, whilst our 2 middles, Joseph and Andy did some great defence blocking out our taller opponents. Dominic, Dion and Hugh have improved significantly as our outside hitters, whilst Ziya is doing a great job learning the role of Universal and middle. Our pocket rocket, Matthew Rennie has been tearing up the backcourt as our super-libero and puts his heart into every play. Its great to see all of the boys putting in the hard yards at training every week and then applying their new learnings in matches at SVL. This week our U19 Juniors faced another tough match against SWV-Khalsa and although our boys have improved their game play, it wasn’t enough to hold out the strength of Khalsa and went down in 3 sets. This week we were down some players due to injury and commitments to the Honours Black team. We played against Eagles and managed to put in a solid performance. Willis did a great job as our setter, whilst the return of Joshua (from overseas) was a welcome addition to our team. Our outside hitters Jon and Joshua formed a great attack all game, whilst Hao was unstoppable through his quick middles. Samuel returned to the team after his ankle injury and managed to also hit some great balls through the middle. Laymond kept the back court alive and continued to motivate the whole team as libero, whilst Lynus played a solid game in the Opposite position, showing some great placement in his spiking and winning us some key points. Although Alberto warmed up, he didn’t really show the skills necessary to get onto the court, so we had to bench him for the entire game. 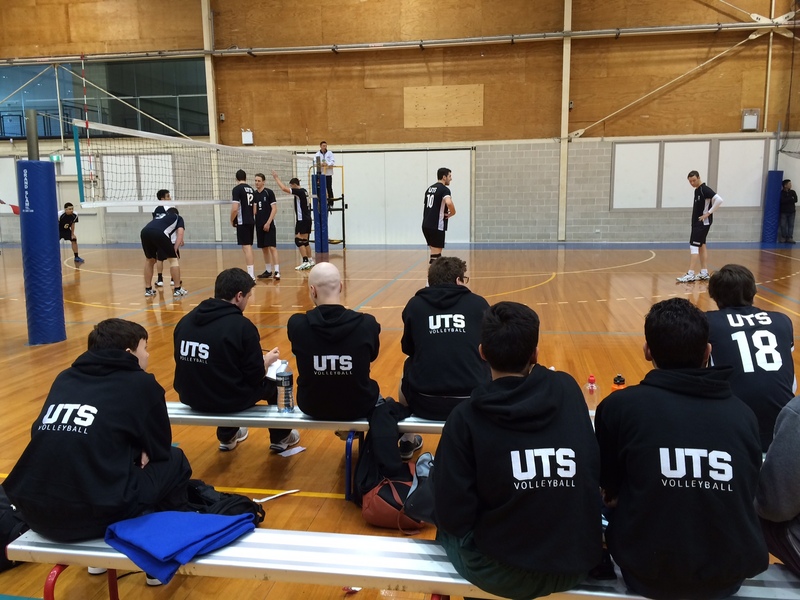 Results: UTS Div 2 Men def Eagles 3:0, 25:13, 27:25, 25:19. Week 6 saw most teams back out at Homebush for more games. Facing up to a Manly team who had beaten the Cougars & Cubs in week 4 was going to be a tough assignment for the Div 1 ladies. After a sluggish start we eventually went down in the second (just 26:24). And after that promising start we decided to take the game to Manly, playing some good volleyball to win the second and third sets 25:11 and 25:22. A few too many errors and some good play from the Manly team gave them the fourth set 25:16. The stage set… we went into the fifth feeling good. We eventually went down 15:11. A great performance by our group all around. Thanx to Missy for filling in for our travelling setters and great to see Sophie back on court. Whilst Joanne Kelly and Dani Rogerson were off running the Sutho to Surf, the 7 UTS ladies slogged it out against Endeavor… Ha who am I kidding, we crushed them. However, during those games that are not as challenging we set goals. We were successful in our goals of keeping our consistency, running a few plays and keep our challengers under the score of 10. That actually happened for the three set win. We saw our team work strengthen and our communication continue to finish the first game in 40 minutes. A quick break for something to eat and we were back to face Sydney Uni. Dani and Jo arrived, one more puffed than the other. But both triumphant in finishing – well done ladies. We expected this to be a tougher match and our warm up was fierce. Deb was so keen to play middle that she was running shoots, a’s and b’s like a demon! The first set flew by quickly with Cat wondering where it all went as she stepped into the front court at 17-2. The second set, was closer. UTS Cc’s looked like we were quietening down and cooling that storm we had in the first set. But the never say die attitude, complete commitment to hitting the ground out us back in the game with a 6 point catch up and it was tense at 22-22 all with a time out call by Sudney uni. Quick pep talk, re focus and we won the second 26-24. Realizing that Sydney uni had picked up there game our third set had to be good! Actually great! Minimal errors, placement and watching the dumps from the crafty opposing setter. But we were craftier (is that even a word?) the third set whipped past as quick as the first 25-8. Two wins, consistency at a high level and a great level of communication. Days like that, you just have to love this sport. Only a few teams in action during week 5. This week our Junior Boys U19 Team had a Bye along with many other teams in SVL, but our Div 2 Men had a game vs our good friends Super Sikhs. This week was going to be tough for our players and coaches who had just returned from Nationals in Canberra, and in particular Samuel was sidelined due to a rolled ankle injury. 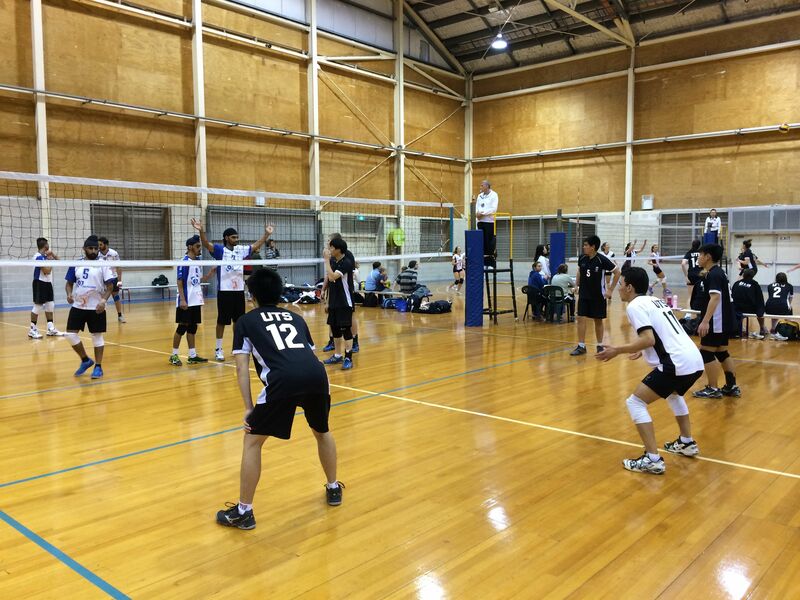 We welcomed a new player this week, Zak from Div 1 Men and he took on the role of libero, whilst Laymond stepped into the role of Outside Hitter and Jarrod filled in as Setter with Willis. We got off to a great start with some very strong attack from our hitters and comfortably won the first set. SS came back strong in the 2nd set and we couldn’t stop them. The 3rd set became a real battle for both teams, with every point past 25 going to the wire, and eventually SS won it 28:26. In the 4th set we again had a close game, going point for point the whole way, with SS taking out the final set by 2 points to close the match. A great match between equal opponents, with both teams on equal total points, so great effort by our boys. You are currently browsing the UTSVC blog archives for July, 2014.